NO E-CIG / DATING / ADULT / GAMBLING / PHARMACY / LOAN / BETTING / BUYING LIKES,FOLLOWERS VIEWS / BOOSTING TRAFFIC / MARIJUANA / HEALTH SUPPLEMENTS OR EBOOKS / PHONE UNLOCK / GAME CURRENCY / PAYDAY LOANS OR ANY ILLEGAL CONTENT ALLOWED. 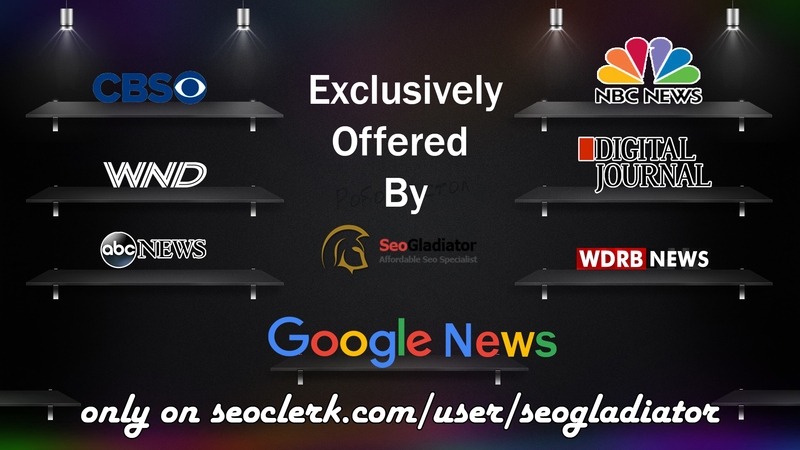 Press Release Writing and Submission to 250+ News Sites, GOOGLE NEWS and 385+ Premium Paid News Websites, News Blogs and Will Do Social Media Blast For Maximum Exposure. Submission to FOX, ABC, CW affiliate networks are offered in my service extras. Will provide complete PDF live links report. Can include images and video. Inbox me for any questions! I will reply fast. write and submit your Press Release to 250 News Sites Google News Plus 4 more Premium Submissions is ranked 5 out of 5. Based on 314 user reviews.